The festival is hosted at Terenure College Rugby Football Club. The address of the club is “Lakelands Park”, Greenlea Grove, Terenure, Dublin 6W. Phone +353 1 490 4283. 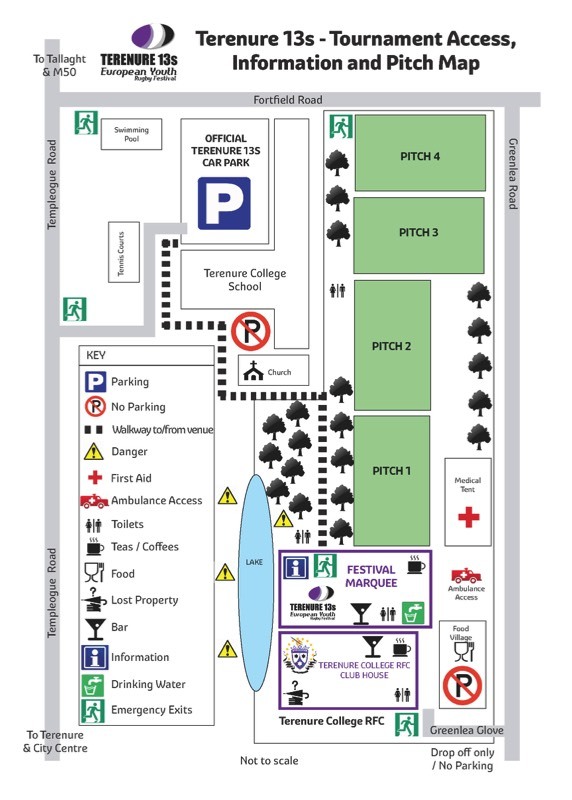 Please note all parking for the 2019 event is at Terenure College which is located on Templeogue Road in the main school car park/yard. Please do not park immediately adjacent to the school's chapel. Also please not that there is no parking at the club itself which is just a short walk away from the school. From Dublin City follow sign posts for M50/N81 or Templeogue. After Terenure village follow Festival signposting. Terenure College RFC has four full size pitches which will all be in use for the duration of the festival. The organisers of the Terenure 13s - European Youth Rugby Tournament have made every effort to ensure that all those participating and visiting will be very well looked after. While the focus is obviously on rugby, every other aspect of the festival is also taken care of - from food and drink, to entertainment, to a great sense of fun ... fun for all the family! The rugby site features ample catering facilities adjacent to the tournament marquee, and is supplemented by the club’s own bar and catering facilities. Practically all tastes are catered for, from snacks and confectionery; to soft drinks, beers and wine. There is a food village on site with a number of excellent outside catering options. In addition there are breakfast rolls available to purchase each day. The club also operates a fully stocked sweet shop, with soft drinks, teas and coffees, cakes and pastries! Nobody goes hungry at the Terenure 13s! - and all at very reasonable prices. The event is supported by local shops, restaurants and pubs in the Terenure area, all part of the “I Love Terenure” group, with many of these just a 10 minute walk away, particularly if you are after a more extensive or ethnic food offer, such as Italian, Indian, Thai or Chinese, or just a hearty steak house or local pub – and there are lots of the latter! The Tournament Organisers make every effort to make the event as entertaining as possible for players, coaches and travelling fans and parents alike. While rugby is the main focus a packed entertainment calendar for the full weekend is also included. Apart from the festivities organised at Terenure College RFC, there are many other activities available in close proximity to the festival site.